10  An excellent wife who can find? This is one of the most beautiful descriptions of a woman at her very essence. A woman of virtue is naturally creative. She knows how to care for her home, her family, and herself. She surrounds herself with beauty and is unafraid of challenge as it is a natural function of life. Without challenge there is no growth. Where there is no growth there is stagnation which is equal to death. Women are survivors. Women are vessels of life. There are so many examples offered when defining woman in the role of a “good wife” : while there are succinct and concise roles defined for husbands. To put it plain, “husbands love your wives and never treat her harshly.” (Colossians 3:19) Husbands are encouraged to treat their wives as they would treat themselves. It is clearly stated in Ephesians 5:33, “In the same way husbands should love their wives as their own bodies. He who loves his wife loves himself.” Therefore, it is assumed that if a man can not love his wife and treat her well it is because he does not love himself. Would you not take care of yourself? Would you not adorn yourself with the best you can afford? All women have the capacity to be of great virtue in the eyes of God. Some women have been convinced that they are incapable or unworthy. They cannot believe that they are noble because people set out to make them believe the lie that they are not. Women are goddesses and are worthy of praise and adornment. If you see a woman who has lost her crown, help her rediscover her glorious inheritance, remind her she is beautifully and wonderfully made. It was written. He is the anchor of the family. He is willing to be tackled by the children and will gladly wake up early to take the dog out while making enough coffee to last all day. He pays the bills, he wheels and deals, he fixes the leak in the back of the kitchen sink. Fathers are the unsung heroes of the family. Mom gets big bouquets of flowers, sweet smelling perfume, gift cards, diamonds, and spa treatments for Mother’s Day. What does the man who provides the roof over our heads get on Father’s Day? A tie. Socks. A tool set. What a rip -off! Fathers train the boys to become men. Fathers train the girls to become ladies. They do this by taking care of not only their own family; but, by also being a pillar in the community, offering leadership, guidance, and strength where needed. Fathers are real men. They are a powerful force that is needed to build our future generations. Far too often we read about the instability of the home due to lack of male presence. Because, at some point we were being conditioned to believe that fathers are not necessary and women can do it all alone, many women and men chose to cut their losses and move on. Single parenting became the “fad”. We subscribed to the belief that one strong parent is enough. Nothing is further from the truth. Without strong male leadership in the home; children suffer. Women are strong, resilient, creative, and capable of raising children alone but having the father present and active in parenting is irreplaceable. If parents can’t get along, they must try to, so as not to suffer the children. We thank you fathers for letting us invite you to our tea parties, for letting us bury you in the sand at the beach, for cleaning the pool, raking the leaves, scaring the boogie man away, and for just being you! Dad you deserve more than a new socket wrench this year, you deserve a round of applause! ATTENTION WOMEN: Avoid men who are like your father if…. He will not pick you up if he saw you walking…. He thinks that providing for a woman is not showing “good stewardship” of what God has given him…. He makes excuses instead of delivering results…. This sounds absolutely NOTHING like your father! I hope not, anyway. Your father would never treat you that way. Even if your father did not raise you, he and your mother did not have a good relationship, or he had another family somewhere else; he is your Dad and he did his level best. Your father is the one man in your life who loves you unconditionally, no matter how you look, no matter how much money you have or not, and no matter if you have made a mistake (or three). Your father is the example by which you are to determine who is worthy of you. He will pick you up if he saw you walking…. Our first teachers are our parents. Some are good at what they do, some try, and others should not be parents AT ALL! Through grace people achieve great things or get better with time. When it is all said and done God is father to us ALL and demonstrates the character traits in the list above. I was fortunate to be blessed with an amazing father. I have always been able to depend on him. Every time I have done things well he was there to cheer me on and encourage me. When I made mistakes he was there to correct me and then remind me that life is a series of comedies and errors. We have good days and bad days; sometimes more bad than good. It doesn’t matter how high we bounce up: it is in how we bounce back that makes all the difference. When you are praising your earthly father, seeking to unite with a man to marry and father your children, or praising your husband and father of your children; first, take time to celebrate the love that God demonstrates for us every day without our prompting. When you examine your relationships with the fathers (& men) in your life never forget that we, by default of faith and grace, always have everything we need! What they provide is an additional blessing to a full bounty of gifts. Today was the last day of school. I had the talk with my kids about how great I felt they are, how much I believe in them, about how much they have learned and grown, and how I wished them all the best for next school year. I encouraged them to take their class folders home and to share their work with their parents. I packed up all my stuff, loaded it in to the car, and left the building! School’s out for summer! This time I may be gone for good. Broward County Public Schools is embroiled in upheaval. People don’t know what is going to happen. I’ve been surplussed. Who knows where I will be next year? I’m confident though. This is a time for great change to occur in my life. I’m cool with it. I have become very good at dealing with change. I know I will land on my feet, I always do. Today my “friend” was quite unfriendly. He basically confirmed what my intuition was saying for months. That’s fine too. I forgive. I forget. I press on. I also leave with parting words that will never be forgotten. I am sweet as they come, until I’m crossed or my intelligence, honor, loyalty, or virtue is questioned…compromised. All I have in this world is my word and my spirit and I won’t let anyone get away with disrespecting it or trying to break it (or me). Do more than exist, live. Do more than hear, listen. Do more than agree, cooperate. Do more than talk, communicate. Do more than grow, bloom. Do more than spend, invest. Do more than think, create. Do more than work, excel. Do more than share, give. Do more than decide, discern. Do more than consider, commit. Do more than forgive, forget. Do more than help, serve. Do more than coexist, reconcile. Do more than sing, worship. Do more than think, plan. Do more than dream, do. Do more than see, perceive. Do more than read, apply. Do more than receive, reciprocate. Do more than choose, focus. Do more than wish, believe. Do more than advise, help. Do more than speak, impart. Do more than encourage, inspire. Do more than add, multiply. Do more than change, improve. Do more than reach, stretch. Do more than ponder, pray. Do more than just live, live for Jesus. 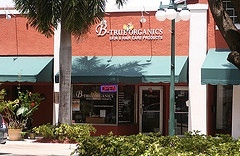 Last, Carleen adds, “We believe in educating our consumers about these products to assist them with healthy choices when purchasing personal care products.” Overall health, eating clean food, drinking lots of water, and getting plenty of rest helps her consumers live up to the company motto, “B-true to your skin, B-true to your hair. B-True to yourself.